Thank you, Jeannette of French Paintings, for nominating art does matter for the “One Lovely Blog Award.” I’m thrilled to be chosen especially on this week that marks my seven-month anniversary of starting this blog. The rules of accepting this award are pretty simple to follow. 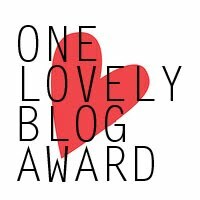 First, you must thank the person who nominated you; secondly, tell seven random things about yourself; then nominate up to fifteen other bloggers for this award, and let them know you’ve nominated them. 1. I actually LIKED all those art history classes I was required to attend while in school. Although I never did appreciate the professors’ rules of having “to correctly list the work’s creation date within five years” on exams – I did enjoy sitting through their lectures. 2. Having pets, particularly cats, is something I love. I do have a soft spot for purebreds, but my very first pet was a domestic shorthair boy cat who sadly passed away far too young. My iPhone at any given time is chock-full of new pictures of my two cats, Ivan and Indie. 3. I always prefer receiving emails to getting phone calls. 4. Computers, software and social media are way too enjoyable for me – I love especially the convenience it’s brought to our lives. 5. I love to cook all types of food. I make a great chicken curry recipe and another fusilli pasta recipe that my husband adores. 6. Some nights, I like to enjoy a good wine with dinner. Red or white – doesn’t matter – and doesn’t need to be pricey to be good. 7. Shocked as I am to admit it, I’ve come to like suburban living. Having spent a decent amount of time living in downtown Philadelphia and NYC, I can finally have an art studio space that isn’t supposed to be a kitchen table. I’m still close enough to two major cities to view art, get inspired, and write this blog! Thanks so much for including me in this! Thanks for including me …I have 2 cats, too, (males). How kind of you to include *wonderingmind studio* – thank you! Thanks for including me. I’m very honoured! thanks for including re:retro…it’s lovely to be amongst such accomplished blogs. plus artdoesmatter is a FANTASTIC blog! Congrats on your blog’s shine! I’m checking out some of these blogs now! The suburbia thing is so sad but true, isn’t it? Hi Patricia… thanks for the nomination 🙂 Just finished my post – took me ages to come up with seven secrets that wouldn’t bore of socks off everyone! I like your blog . It is like your blog theme says , it’s refined and ¨fresh and clean ¨ .